Il Duomo - a large, premium quality Dome Glasstop Humidor, can keep up to 150 cigars fresh. With its tempered beveled glass dome top and rich mahogany finish this cigar humidor creates an elegant appeal. Opens and closes smoothly on hidden quadrant and piano hinges. 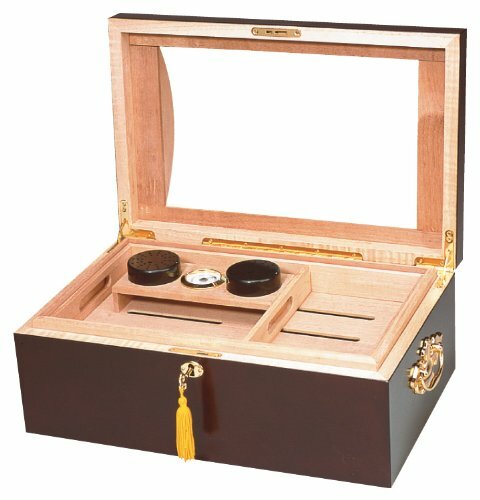 This humidor contains 2 round humidifiers and 1 glass hygrometer with brass frame. Its spacious interior has 1 Spanish cedar tray with divider and 2 dividers at the bottom lined with premium kiln dried Spanish cedar. It is equipped with SureSeal technology that insures proper lid seal on closure. This stylish cigar humidor features gold plated lock and key with tassel, as well as engravable brass nameplate and scratch resistant felt lined bottom. Perfect to hold your cigar collection or as a great gift item. If you have any questions about this product by The IL Duomo, contact us by completing and submitting the form below. If you are looking for a specif part number, please include it with your message.